Hi everyone! Are you looking for a easy, fun, structured physical education curriculum? I have a wonderful giveaway for you today courtesy the awesome people at Family Time Fitness! 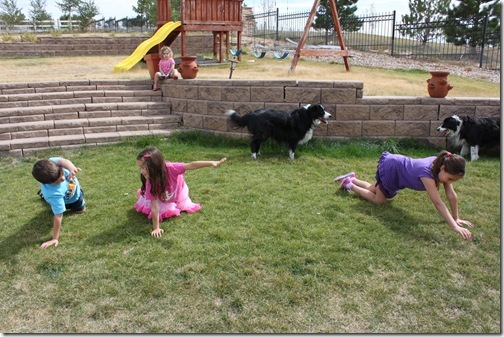 What is Family Time Fitness? We’ve just started this program this year, and while we don’t get to it every day, the kids really love it when we do! 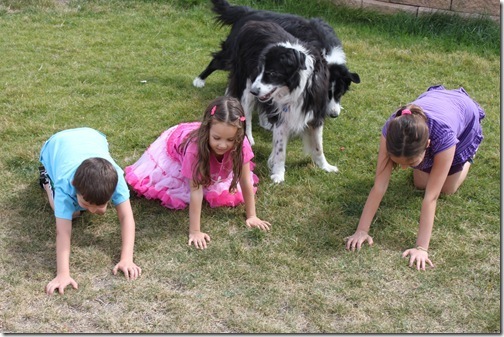 I started out giving them the physical fitness assessment. 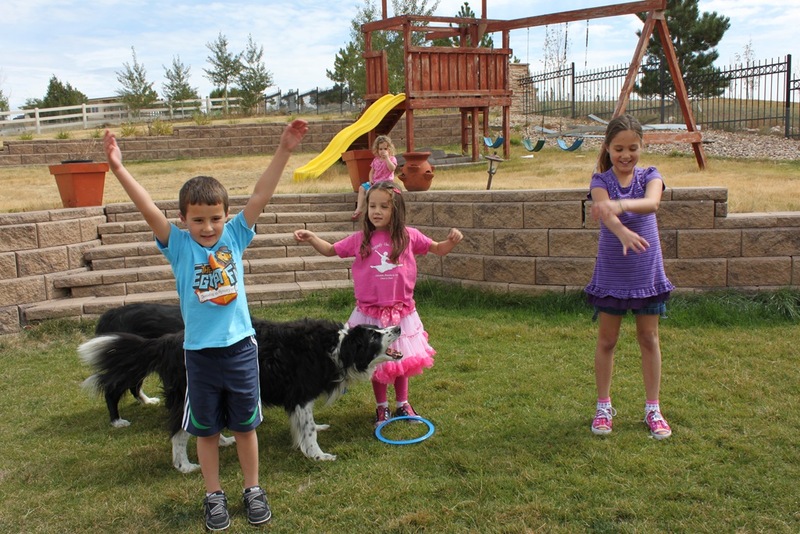 The Family Time Fitness curriculum comes with a progress chart so you can record and see the improvements in your students! 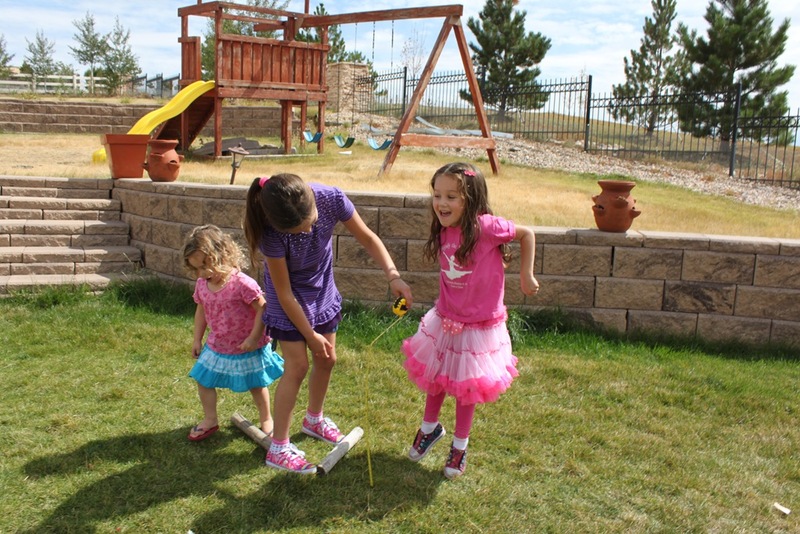 Here we’re measuring the standing vertical jump of Tinker bell. Not sure if you can tell but we had to do it a couple times just to get her off the ground! Most of the activities are super easy, and fun. And just in case you’re not sure about how to perform a certain activity, they give you links to videos so you can actually see how to do them as well. There is a small list of extra items you will need over the course of the year. They include hula hoops, balls, cones, a measuring tape, stop watch, and an exercise mat. And that’s really it! Like I said the activities are really easy to do and I LOVE that! 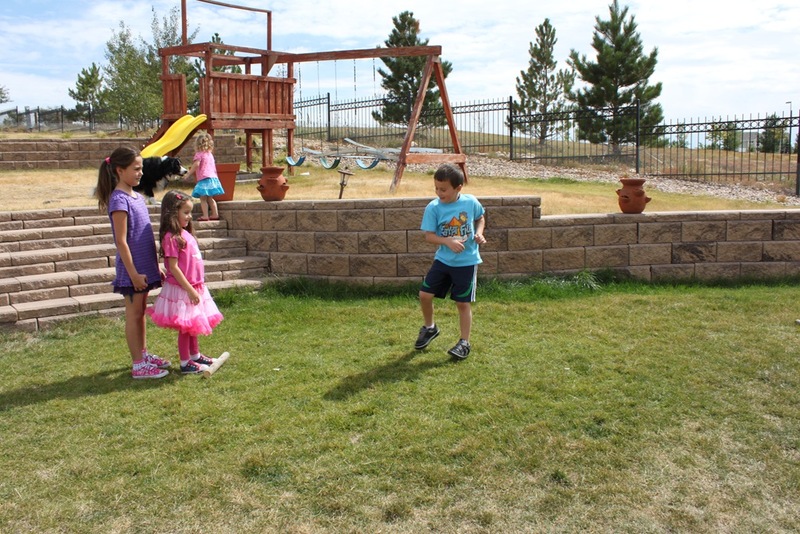 Honestly I don’t have much time to plan or prepare much else for homeschool and I have to say that the Family Time Fitness program makes it super easy for me! Each lesson starts with a 5-10 minute warm-up followed by 10-15 minutes of activities and games, then a 3-5 minute cool down time. Here we’re doing leg swings and arm circles. Below we’re doing a shuffle/skip/hop series. I set up 2 sticks on the ground so the kids would have some reference as to where to start and stop, then we took turns doing each skill. What does the curriculum include? Here we are doing our sit ups for the progress chart. Turbo lived up to his name going bonzai with the sit-ups! I actually had to stop him finally. So What’s the cost? $99 for an entire year’s worth of activities. You can also sign up for a 2 day FREE trial just to see if you like it! 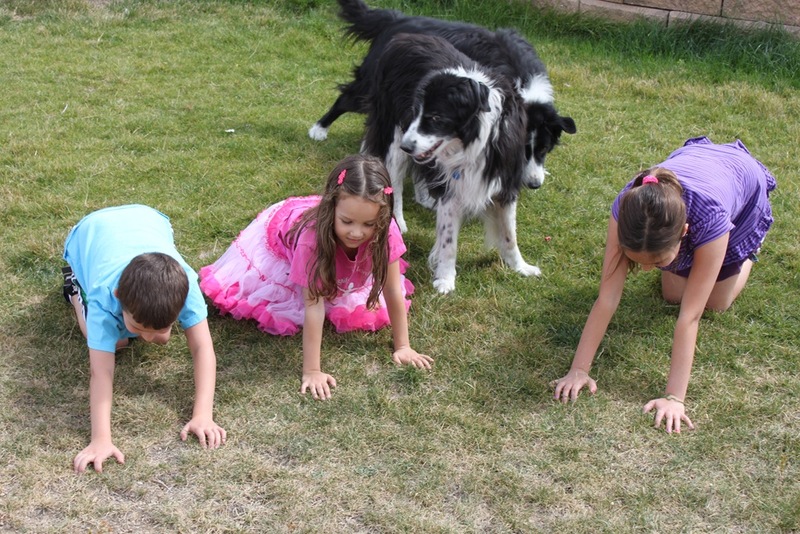 Although the Teeny Tot bailed for this one, the dogs seemed to be interested in our stretching. 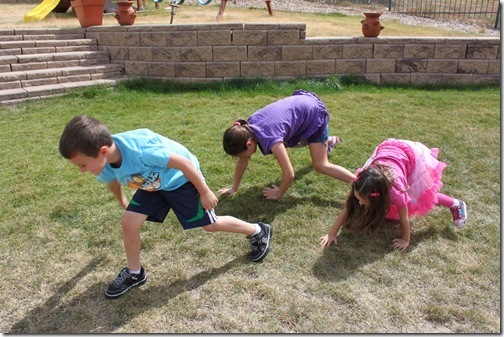 This was one of our favorite activities, the bear crawl! Want more information? Visit any of the links below! You are seriously NOT going to believe this giveaway! The Family Time Fitness team is offering 2 of their Core Curriculum and workbooks Vol 1-4! Leave a comment on this blog post letting me know you’d like to win! The give away will be open until midnight EST Friday October 7, 2011. Winner will be announced by Sunday Monday 10, 2011. Make sure to leave a separate comment for each entry, winner will be chosen at random! Please leave a way for me to contact you in your entry otherwise another winner will be chosen. NOTE: This giveaway is a downloadable product so it is offered worldwide! 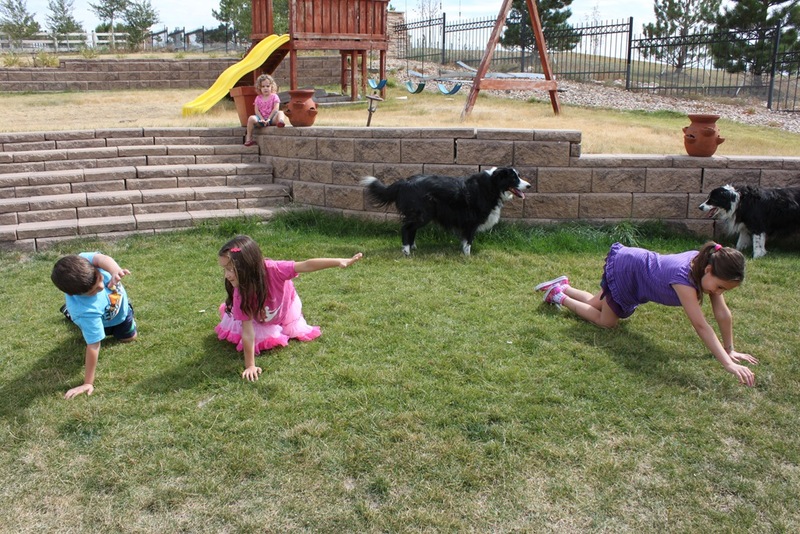 Disclosure: I was provided with a free Family Time Fitness curriculum for review on my blog. The opinions I have given are mine and may differ from others but were not influenced by the company or the free product provided. I would love to win this. 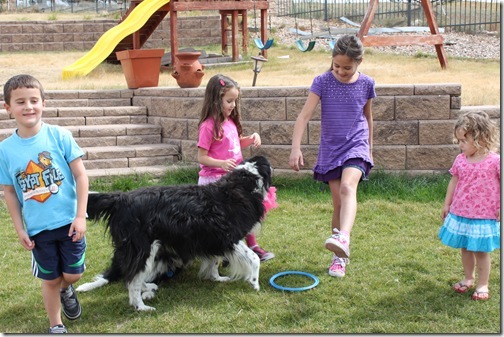 Our homeschool definitely lacks in physical fitness even though my kids love to move and exercise. This looks perfect for helping us. This might be the extra motivation I needed to get in shape! It’s so hard to find the time and it would be great to do it together as a family. Thanks for the giveaway! Ha ha That jumping is so funny. My 2 year old is currently really into jumping. He giggles and twists like it’s the best fun ever. 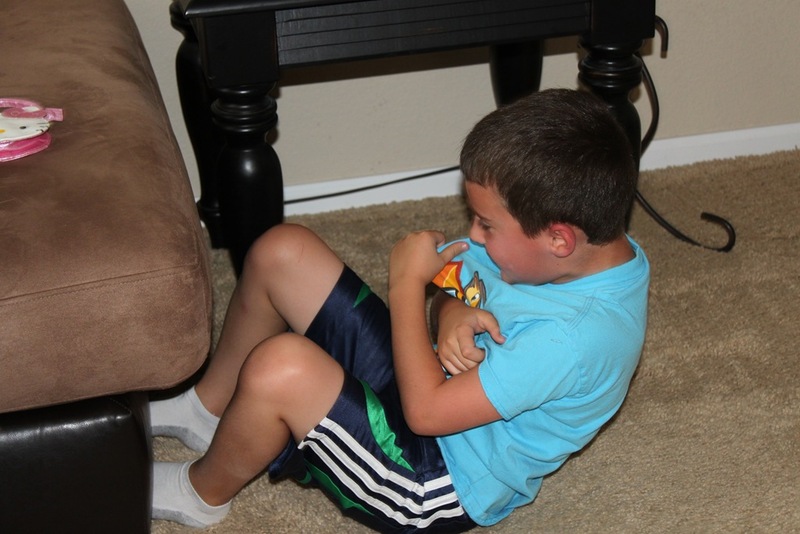 He bends his knees and couches down so low you are sure you’re about to see an olympic medal worthy high jump. He springs up and his arms really go, but the feet never actually elevate off the ground. It is so stinking cute I can hardly stand it! Yes! We would love this! Thank you Erica! And I follow you via email, thank you again! Ohh, looks like a great motivator to get us moving and more active together during our ‘school’ day. Loving this. We had to pull my daughter out of our PE co-op due to some physical limitations that she is dealing with and we are looking for other physical options for her to keep her in shape. This looks like this may be a great option, something that we can do at home and work it around her current abilities. What a mental boost for her. Thank you so much for reviewing this program and offering the giveaway.